Spring has arrived! The ground is thawing and it’s a great time to start thinking about fresh, homegrown food, particularly early-spring herbs. Fresh herbs are a home garden staple that add plenty of flavor and nutrition to your meals, while also taking up very little space. A spring herb garden only needs a small amount of room to flourish, and there are many varieties of herb that can grow well in spring. Early spring is clearly a time of climactic flux. With warm days and cold nights, it can be a very difficult growing season for a number of plants. A spring garden, however, can be prepared for the season and even allow for certain herbs to grow. Some herbs, and many other vegetables, are less likely to survive outdoors through the season and need to be planted when things warm up. But that doesn’t mean you can’t enjoy some indoor spring herb gardening while getting your garden ready for the full growing season. If you’re looking to get an early start on your planting season, spending the next few days preparing your garden, and then planting some weather-resistant herbs is the best way to get things rolling. Cilantro is the perfect herb for an early spring garden because the seeds will tolerate cold temperatures and can even handle the occasional spring dusting of snow. And when temperatures begin to rise, it will start growing quickly. Also called coriander, cilantro is an annual herb from the Apiaceae family, making it a relative of carrots, celery, parsley, and over 3,600 other plants. In the United States, the seeds are typically referred to as coriander and the leaves are cilantro. All parts of the plant are edible, but the dried seeds and leaves are most commonly used to add flavor to dishes. Cilantro leaves look like flattened parsley and have a very strong aroma. They are a very popular addition to countless foods. Cilantro leaves are used regularly in Mexican marinades, and as a garnish to provide added flavor and freshness. Coriander, on the other hand, is often used in East Asian and Indian dishes. Plant-based foods are known to offer numerous health benefits, while herbs themselves are a perfect way to add flavor to food without sugary, salty, or fatty sauces. More plant-based foods and fewer processed foods in your diet means a lower risk of obesity, heart disease, and diabetes, and increased energy and overall health. It’s true that basil is a herb that loves the heat and is best suited for summer growth, but that doesn’t mean it’s too early to start preparing for it. Not only can you prep your garden in early spring, but basil typically does best if seeds are started indoors, then transplanted outside when it gets warmer. So it makes sense to get a head start on warm-weather basil during the spring! Sow your basil seeds near a sunny window or in a greenhouse during early spring. In early summer, transplant them to your vegetable/herb garden. There are multiple types of basil, including Thai basil, Holy basil, and sweet basil, which is most commonly used in Italian cuisine. It is part of the mint family, and is also known as Saint Joseph’s wort. Generally, basil has a warm, spicy flavor that serves as the base for pesto, and can be a great garnish for soups and chili. It goes great on eggs, fish, poultry, and meat, too, (as does its cousin, tarragon [Artemisia dracunculus]). Potent antibacterial qualities—lab studies indicate that a variety of oils in basil are able to restrict the growth of various bacteria types. It has been used for centuries in Tamil and Ayurvedic medicine for several purposes, as well. Dill is a great herb for early- to mid-spring growth. It grows very quickly in cooler temperatures and can help satisfy your craving for fresh flavors earlier in the season than many other herbs. Dill reseeds itself once it’s been trimmed back a few times, so planting in the spring and continuing to do so will ensure you’ve got plenty to last through summer, allowing it to be used on planked salmon, potato salads, and other seasonal specialties. Sow your dill seeds in early spring, 1/4-inch deep in the soil, spaced nine inches apart. The BBC describes dill’s potent and unique flavor as “a combination of fennel, anise and celery, with warm, slightly bitter undertones.” It is green with wiry, thread-like leaves that grow together in clusters, and can be added to a variety to a variety of dishes as a flavorful garnish. You can start growing rosemary in late spring, though it typically responds best to warm, humid conditions where it can enjoy between six and eight hours of sunlight per day. Because temperatures below 30 degrees F (or -1 degree Celsius) can kill the plant, they may not be safe for the elements during early spring. That said, the plants can be seeded and planted indoors before moving outside when the temperatures climb. Rosemary is an attractive herb that has needle-like leaves and an enjoyable piney scent and flavor. Growing rosemary is relatively easy, just make sure you’re using well-drained oil and allowing them adequate sunlight. Sow seeds indoors in early spring and transplant outdoors when summer arrives. Alternatively, you can grow rosemary from a cutting by clipping off four-inch pieces from an already-thriving rosemary plant. After stripping the leaves from the lower inch of the stem, place each cutting into a pot filled with coarse soil and peat moss. Roots should grow in about three weeks. Rosemary is commonly used to provide relief from digestive troubles. Chives are close relatives to garlic, shallot, leek, scallions, and Chinese onion as part of the Allium family. Their flavor is most easily described as mildly onion-y, and they are a great addition for infusing flavor into endless common foods. They can be sliced and stirred into mashed potatoes, or added to salads, cream cheese, eggs, sauces, and more. Chives look like skinny green onions, and seeds can be sowed in spring or fall. Place them in holes 1/2-inch deep and 12 inches apart. When the seedlings are established, thin your rows to six inches apart. Like all the other herbs on this list, chives are very nutrient dense and excellent contributors to a healthy diet. Even one tablespoon offers a good serving of vitamins A, C, and K, as well as minerals like calcium, magnesium, and potassium. Anti-cancer—Allium vegetables have been closely studied for their effect on stomach, prostate, and colorectal cancers. Because spring is likely the first time you will have seen your garden in months, it is wise to dedicate time to preparing it for the growing season. Survey and repair: Look for damaged branches that may have fallen onto your garden and clear out the space. Also make sure your pathways are safe and the winter has not caused damage to steps, walkways, etc. Cut down last year’s foliage and rake mulch. Clean up your tools: Wash and examine your tools so they are ready to go when you need them. Prune shrubs: Clip the dead or weakened branches from shrubs to encourage new growth. Prepare new beds: Get soil ready for planting by removing debris, digging the soil to add oxygen, and composting so it’s ready to go. Fertilize: Be sure to use a balanced fertilizer (6-6-6 or 8-8-8). Herb gardens are great because they are relatively easy to maintain and can add plenty of flavor and nutrition to countless meals. Get started as soon as the temperatures allow and you can get down into the dirt to plant your seeds! Jeanroy, A., “5 Garden Herbs to Plant in Early Spring,” The Spruce, February 2, 2019; https://www.thespruce.com/herbs-for-early-spring-gardens-1762517, last accessed March 27, 2019. Savage, K., “5 Ways to Jump-Start Your Garden for Spring,” Bob Vila, 2019; https://www.bobvila.com/articles/spring-gardening-tips/, last accessed March 27, 2019. 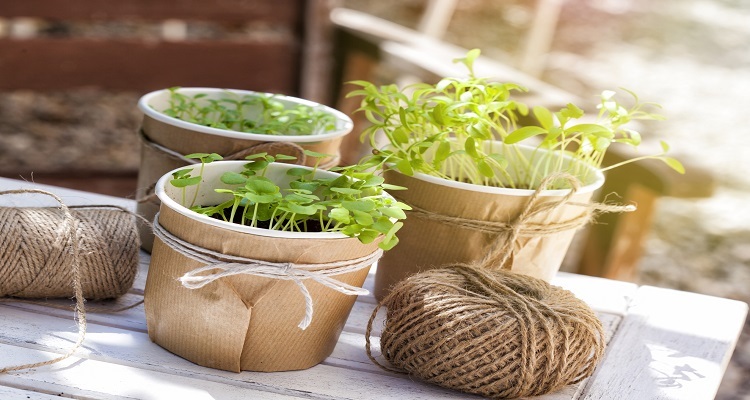 “Growing Herbs: The 10 Best for a Home Garden,” Reader’s Digest, 2019; https://www.rd.com/home/gardening/growing-herbs/, last accessed March 27, 2019. “12 Essential Spring Gardening Tips,” Martha Stewart Living, March 1996; https://www.marthastewart.com/270176/spring-gardening-tips, last accessed March 27, 2019. Tilley, N., “Growing Rosemary Plants: Rosemary Plant Care,” Gardening Know-How, 2019; https://www.gardeningknowhow.com/edible/herbs/rosemary/growing-rosemary-plants-rosemary-plant-care.htm, last accessed March 27, 2019. Nordqvist, J., “Everything you need to know about rosemary,” Medical News Today; https://www.medicalnewstoday.com/articles/266370.php, last accessed March 27, 2019. Seyedemadi, P., et al., “The Neuroprotective Effect of Rosemary (Rosmarinus officinalis L.) Hydro-alcoholic Extract on Cerebral Ischemic Tolerance in Experimental Stroke,” Iranian Journal of Pharmaceutical Research, Autumn 2016; 15(4):875-883; https://www.ncbi.nlm.nih.gov/pmc/articles/PMC5316267/, last accessed March 27, 2019. Ware, M., “Chives: Health benefits and uses” Medical News Today, February 24, 2017; https://www.medicalnewstoday.com/articles/275009.php, last accessed March 27, 2019. Ware, M., “Health benefits of cilantro (coriander),” Medical News Today, January 5, 2018; https://www.medicalnewstoday.com/articles/277627.php, last accessed March 27, 2019. Smith, J., et al., “Effect of marinades on the formation of heterocyclic amines in grilled beef steaks,” Journal of Food Science, Aug. 2008; 73(6):T100-5; https://www.ncbi.nlm.nih.gov/pubmed/19241593, last accessed March 27, 2019. Bhat, S., et al., “Coriandrum sativum on Pain and Inflammation,” International Journal of Research in Pharmacy and Chemistry, 2014; 4(4): 939-945; http://www.ijrpc.com/files/25-4196.pdf, last accessed March 27, 2019. Hwang, E., et al., “Coriander Leaf Extract Exerts Antioxidant Activity and Protects Against UVB-Induced Photoaging of Skin by Regulation of Procollagen Type I and MMP-1 Expression,” Journal of Medicinal Food, Sep. 2014; 17(9): 985-995; https://www.ncbi.nlm.nih.gov/pmc/articles/PMC4152784/, last accessed March 27, 2019. Wangensteen, H., et al., “Antioxidant activity in extracts from coriander,” Food Chemistry, Nov. 2004; 88(2): 293-297; https://www.sciencedirect.com/science/article/pii/S0308814604001219, last accessed March 27, 2019. Nordqvist, J., “Why everyone should eat basil,” Medical News Today, January 3, 2018; https://www.medicalnewstoday.com/articles/266425.php, last accessed March 27, 2019. Vijayalaxmi, A., et al., “Anti-Arthritic And Anti Inflammatory Activity Of Beta Caryophyllene Against Freund’s Complete Adjuvant Induced Arthritis In Wistar Rats,” Journal of Bone Research and Reports, 2015; 1(2): 9; https://pdfs.semanticscholar.org/c669/8a3f4eda856936b2756be5bf575aa3e0ffa4.pdf, last accessed March 27, 2019. Watson, M., “All About Dill” The Spruce Eats, March 19, 2019; https://www.thespruceeats.com/all-about-dill-4117140, last accessed March 27, 2019. “Dill Recipes,” BBC, 2019; https://www.bbc.com/food/dill, last accessed March 27, 2019. “Dill” Web MD, 2019; https://www.webmd.com/vitamins/ai/ingredientmono-463/dill, last accessed March 27, 2019. Carberry, A., et al., “How to Grow Rosemary,” WikiHow; https://www.wikihow.com/Grow-Rosemary, last accessed March 27, 2019.